Frequently asked questions relating to Benslow Music courses. The answer is probably yes! We pride ourselves on bringing the very best out of our students, whatever their level of achievement. We specify an approximate ability range which will help you choose your course, but once happy with that - and we will gladly offer advice - nobody need feel that they are competing with anyone except themselves. Where a course is particularly demanding we say so, and our carefully selected tutors are expert at giving equal attention and respect to everyone. So don’t be shy! Courses normally begin with a welcome shortly before supper. You can check in any time after 4.00pm. Some courses however begin at different times. This will be noted in the course description online and in the printed brochure. 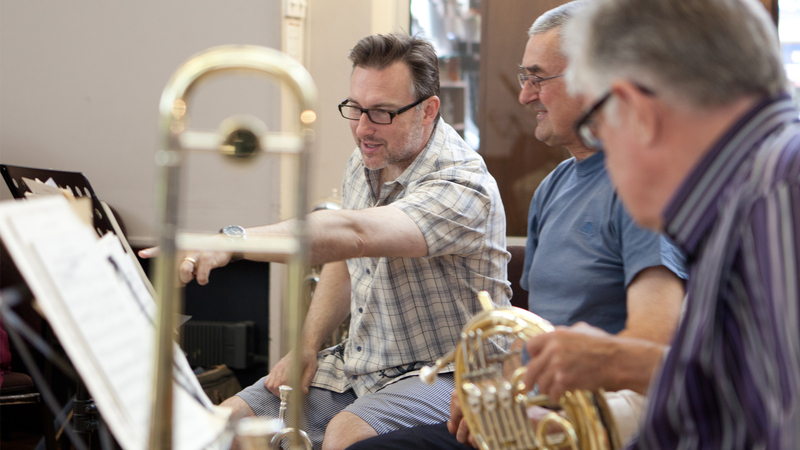 For a guide to your course at Benslow Music please see the standard course timetable available here, however session times for some courses may differ. Please check the course description, foyer noticeboard or contact us for more details. Will practice space be available on arrival before the course officially begins? We cannot guarantee that playing rooms will be available outside course times. If you require pre-course practice facilities please let us know in advance and we can let you know what is available. Members of Benslow Music Trust may be able to book pre-course practice free of charge from 2.30pm-6.30pm on the day of the course, but this is subject to availability and no guarantees can be offered. If you have been assigned a particular room for a course we cannot guarantee that the pre-course practice room will be the same one. Details on how to become a member are available here. The Benslow Music campus has ample free car parking facilities. How do I book a course and what do I need to pay? Each course has a ‘Benslow Standard’ allocated to it, details of which are listed here. Please see the course description for further information. If you have any queries regarding your playing standard please contact us and we will try to advise you further. Can I stay at Benslow Music before and/or after my course? Bed and breakfast before and/or after the course is usually available. Please call us on 01462 459446 for rates and availability. The Resident course fee includes tutoring, standard accommodation, all meals and tea/coffee breaks (with our famous cakes). The Non-resident fee includes everything except accommodation and breakfast. If you wish to occupy an en-suite room the relevant supplements can be found here. Non-residents may take breakfast on payment of the appropriate fee. This depends on the course. Some courses require you to prepare something of your own choosing, some courses require preparation of particular repertoire and other courses require no preparation at all. Please read the course description for further details or contact us. Your instrument, a music stand if appropriate for the course, music you wish to work on or have prepared, appropriate changes of clothing and yourself! Benslow Music provides towels and toiletries; hair-dryers and irons are available to borrow from Reception. Can I bring a friend or partner as a non-participant? Bed, breakfast and other meal rates apply to non-participating guests. Places are subject to availability. If the non-participating guest wishes to observe sessions an observer’s fee will be required. Please contact us to discuss your options. If I need to miss part of the course do I still need to pay the full course fees? We can offer pro-rata rates if the course tutor agrees. Please contact us if you require further information. What do I do if I need to cancel my place on a course? Full details of our cancellation policy can be found in our terms and conditions here. How do I get to Benslow Music? Travel instructions can be found here. Do you have Wi-Fi facilties? A Wi-Fi internet connection is available to laptop, tablet and smartphone users across the whole campus. The current password is displayed in the main foyer. The site has disabled access and we have two wheelchair accessible en-suite bedrooms. Please let us know when you book that you require disabled access and we will do our best to accommodate your needs. We are happy to offer carers free accommodation (providing you are sharing a room) and free meals for the duration of your stay. I have special dietary requirements/I am a vegetarian/vegan. Can you cater for me? The kitchen can cater for a variety of special diets and medically diagnosed dietary requirements but must be told about these in advance. Please let us know when you apply. What time are we expected to vacate our room? Rooms should usually be vacated by 9.15am on the last day of the course. However, when another course is due to arrive shortly after your course departs, you might be asked to vacate your room earlier. We will inform you if this is the case. What is the difference between Standard and En-suite bedrooms? Standard Room – washbasin in the room and shared bathroom facilities (normally between no more than three rooms). En-suite - room with an en-suite bathroom and shower. Some rooms also have a bath, please let us know when you book if this is something you would prefer. The course balance is due four weeks before the start of the course. The date is on your course booking acknowledgement. We ask that you pay before the date so we don’t waste money on posting a reminder. Can I bring my pet to Benslow Music? Unfortunately, with the exception of assistance dogs, we do not allow pets onto any part of our campus.